Here's what I expect myself to do as a Crossfit Coach...Make my athletes better at it! Some people just move faster than others. In the short amount of time I have been working with Teo, he has rapidly improved. Young, focused and unbelievably driven is who this kid is. His story is about work ethic. His peers respect him because he puts himself out there as the guy who is going to lead by example and demand that they keep up or get left behind. I see Teo as a natural leader and as a young man who is destined to bring out the most in many, many people in the years to come! Stay on the lookout for this kid in the CrossFit and the Austin community as a whole! Athletes Train! This is a simple concept that most people don't fully understand! Sometimes over-complicating things or letting negative emotions into the realm of training sessions hold people back from seeing more rapid success. Russ is not one of those people. Since coming into the gym, Russ has continued to exceed himself in every way possible. I have to give him all the credit in the world, and in many ways I am not even sure how he is able to do what he does. I see Russ at CrossFit Central and Red Black Gym often 6 days a week. Training Monday through Saturday is something not very many people can or should do. All this tells me is this guy is doing everything else right! Sleep, nutrition, mobilization and probably prayer are keeping this man going strong daily. Laurie's story represents one of the true essences of CrossFit's ability impact a person's lifestyle at a deep and meaningful level. Watching her get out of her comfort zone has been remarkable. I am proud to see this woman take on a program like CrossFit after spending her whole life prior to it without ever taking on physical challenges or being an athlete. She has found a new self through the experience. Seeing how her success has inspired her husband to join us a year later speaks volumes for how much Laurie is truly a positive model for her family, friends and anyone else she comes across on a daily basis! This month I picked a client who makes me proud to train him. Everything I have to teach is something Dru craves as a client. He is an achiever and he seeks out mentors/coaches to get him where he wants to go. If there is something you know that he doesn't, he will find you and get you to teach it to him. I haven't seen many people excel to the level that Dru has in a shorter amount of time. Ambitious, Hungry and Humble are rare qualities but this guy has them. Matt is the Client of the Month for January! He deserves this recognition as much as anybody could. When deciding who to highlight, I choose a person I have pure respect for. This is especially true of Matt! His lifestyle is one I aspire to live myself. When I see Matt at CrossFit Central and RedBlack Gym throughout the week, I always get the sense that he is a truly humble person. I have never seen a speck of ego creep out since the time he started with us. Cici intends to be the best every time she steps on the gym floor. If you ever met somebody who is competitive down to the deepest root of their being, it is this woman. She will watch somebody do something then replicate it. She is a fast learner, and waiting for somebody to teach her how is not an option. What is great about Cici is she only enters that zone during her own training time. Outside of that, she is a humble and genuine person. She shows so much care to everyone she speaks to! When Cici first told me she was in a bout with cancer, I had a hard time seeing it. She was consistently showing up to class at 5:30am and booking it out quickly to get to work by 7am, and her work day lasts for 8 to 10 hours. What blew my mind the most was when she would tell me about running 12 to 15 miles in the evenings. All I could think is "Who is this person?" Michael is one of those guys that literally surprised the hell out of me. I am always inspired by clients who start up and show rapid progress. It is hard to anticipate what each client is going to achieve and how early on it will happen for them, so sometimes when somebody begins programs and they look like the average Joe, I don't commonly see an immediate fire breather emerge. Michael is one of those fire breathers! Jess: Michael, it's Jess...I can't come to class for a while! Jess: I was doing back flips on a trampoline and the seams busted...I fell through the trampoline onto a bed of rocks. Next thing I knew I was looking at the bottom of my foot. I am going into surgery to get screws put in it to put it back together! Kelly has been a fun-to-have client. In her first few months being a client, I wasn't sure of her commitment to the CrossFit Central program. Several times over, all I can remember was feeling like she stranded me by not showing up to class. I was left with no call, no email, no word about where she was and why she missed! This is now a thing of the past! Kelly now comes in high-spirited and with a ready-to-work attitude! Dale is a Big Time player when it comes to living Life! His life experience is one you can hear about and learn so much from! His attitude is top tier. His work ethic is inspiring. His presence cannot go unnoticed. This guy earns his keep, and I respect the hell out of him. 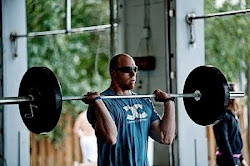 I am honored to know this man and rewarded to be his CrossFit coach! I often work on better mobilization for myself. I actually have many range of motion limitations, but if you didn't know what you were looking for you probably wouldn't notice. Since I started teaching CrossFit, I have seen many individuals who have obvious issues with this. It's kind of like when they move it makes me hurt to watch. I am certain that Tony ranks right up there with the most severe cases. Having been through major injuries in the past, I know first-hand that continuing in any athletic endeavor is a challenge. Knowing what Tony has gone through, it's hard for me to say that I would have been able to battle through the same experience personally. I believe the commitment required by this man to overcome his injuries deserves all the credit in the world! He never has excuses and continues to seek out advice regarding what should be his next major steps towards improvement. When Judy started in programs she was instantly one of my favorite people. I wanted her to have a great experience at CrossFit Central. At the time she started in class I knew she had a lot to learn and a long way to go in terms of strength. The 12:15 class was sold out and had several experienced people working out in it. I decided to invite Judy and a few other beginner clients to start a new class an hour earlier. That allowed me give them the time and attention that would help them improve. Judy success is not a surprise to me! She has an amazing attitude. When I think about her success over the past year this is what comes to mind: Happy, Focused, Ambitious, Eager, Determined, Disciplined, Consistent, Persistent, Unbreakable! I have always been blown away by what kind of changes many of our clients go through after a year or two of CrossFit. Many times these changes don't show up merely in the physical appearances but where it is most needed... Their minds! you get a sense of her true happiness! I believe Melissa you have only begun to tap into the transformation and you are yet still to have an amazing impact on the lives of many people you will cross paths with! Here is what I like about Arun...He has been involved with CrossFit Central for upwards of two years. I cannot remember a time when he has missed without emailing me ahead of time to let me know he would not be there. He has a tremendous amount of character. This guy is disciplined. When he came into our facility his family, friends and peers probably considered him a very fit and healthy person. Arun, expects more of himself and every time he steps into our gym - I sense it! People like Arun inspire me!